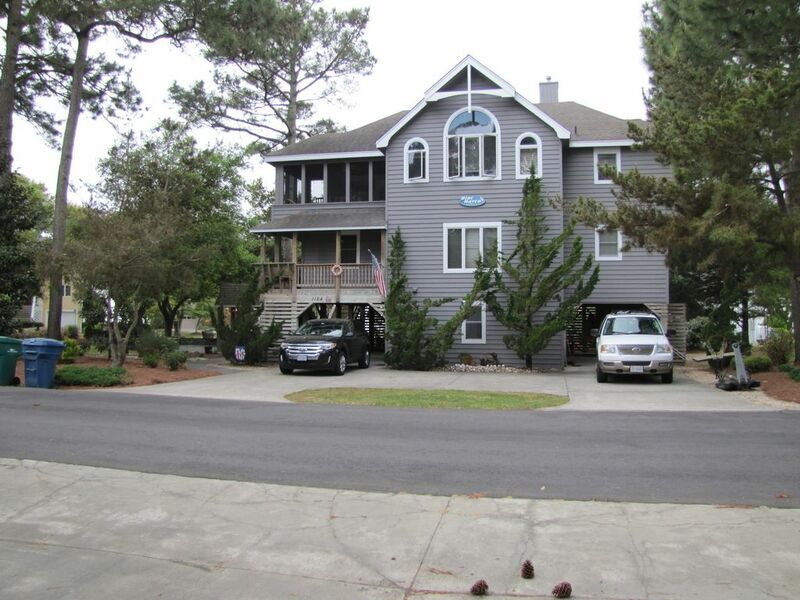 SOUND VIEWS, CLOSE TO BEACH, 5 Bedrooms, Theater, Kayaks, Bikes, ITS ALL HERE! CLOSE TO BEACH, STEPS TO THE SOUND, SOUND VIEWS! JUST A FEW WEEKS LEFT FOR THE 2018 SEASON!! EVERYTHING YOU WILL NEED FOR A WONDERFUL VACATION IS HERE!! NOTE THIS HOUSE IS A SAT TO SAT RENTAL!! READ OUR GUEST REVIEWS! VIEW BEAUTIFUL SUNSETS, WALK TO THE BEACH, LIGHTHOUSE, WHALEHEAD CLUB, WILDLIFE CENTER, COOK A GOURMET MEAL, OR KICK BACK AND WATCH A MOVIE ON OUR 9' SCREEN THEATER. BLUE HAVEN HAS EVERYTHING YOU WILL NEED FOR A WONDERFUL VACATION!! LINENS INCLUDED!! NEW MATTRESSES ADDED TO ALL KING BEDROOMS THIS DECEMBER, ALL OTHER BEDS RECEIVED NEW MATTRESSES IN THE SPRING OF 2017. Blue Haven is a 5 Bedroom, 5 Full Bath beach home equipped with everything you will need for a wonderful vacation. ALL LINENS INCLUDED!! Each Bedroom (except Bunk Room) has a TV and DVD/VCR, plus 50" Flat Screen TV in game-media/room (new spring 2017), 50' Flat Screen Smart LCD TV (new fall of 2017) with surround sound in upper Great Room. Dedicated 36" X Box TV in upstairs Great Room! SORRY NO UNDERAGE STUDENT GROUPS ACCEPTED. NOTE WE ARE A NO PET HOME BUT NOT A PET FREE HOME SO IF YOU HAVE DOG ALLERGIES THIS MAY NOT BE THE HOME FOR YOU AS OUR DOG VISITS ON THE OFF SEASON. 2 covered carports, Game Room/Theater with 9 FT screen, 50" Flat Screen Smart TV, unlimited Netflix's & 375 DVD library , full bath, Bike Closet w/6 bikes, beach chairs, 2 Ocean Kayaks, outdoor shower. 2 King Bedrooms (new mattresses Dec 2017) w/full baths each with deck access, TV's, Duo Bunk room w/twin & full (new mattresses spring 2017) with deck access TV, Bunk Room w/4 twins (new mattresses spring 2017) shares a full bath with Duo Bunk room, Spa (new fall 2018) for 6 on deck, deck extends across entire back of second level. Kitchen with island seating for 3, Dinning area (table for 10), Screened Outdoor eating/sitting ares with seating for 6-8, Great Room: FM Stereo-I Pod ready, 50' Flat Screen Smart LCD TV with surround sound, X Box on dedicated 36" TV, Multi CD, Fire Place (not available in season), Screened Porch (table for 6), King Master Bedroom with Serta Memory Foam Mattress, full bath-jetted tub, TV, large deck across entire back. LARGE SIDE YARD PATIO WITH SOUND VIEWS. Additionally, ground level has large landscaped side patio with grill hut, gas grill, charcoal grill, sound views. PRIVATE AND GREAT PLACE TO GATHER IN THE SHADE OF LIVE OAKS OR FOR YOUNG CHILDREN TO PLAY! We also supply Two Ocean Kayaks, 6 bikes, some beach chairs. Guest enjoy access to all Corolla Light amenities (rec center-indoor pool-tennis-weights & cardio rooms-racquetball, Oceanside pool complex, Guarded Beach, Sound-side pool, Trolley service around community) [trolley service in season only and will pick you up at the house next door and drop you off in front of our home]. Home has a Great Location, steps from the Currituck Sound, short walk to Ocean, Whalehead Club, Lighthouse, Corolla Village with shops and restaurants. We are a family of 4, myself Clell, Carol my wife, Ian our son and Kendall our daughter. I am self employed and in the furniture and home decor industry, Carol is an executive IT consultant at Infrastructure Technology her own firm. We reside in Virginia Beach, two hours from Blue Haven and love the Outer Banks, surfing, being on the beach and in the water. I have been coming to this part of the North Banks since 74 (before there was as road or even any homes in Corolla) and never get tired of the place. Our daughter is a senior at Virginia Tech and our son Ian lives with us. We are always working to improve and investing in Blue Haven to make it a great vacation home! It is very well equipped, having visited the OBX for many years before buying our home we have tried to think of everything you will want, plus we use the house ourselves in the off season so we have put more into it than the average rental home.. The 3 King Beds are very comfortable (new December 2017) and all furniture very nice. The Theater is wonderful and a great place to catch up on movies plus there is the 50' Smart TV in the great room upstairs and the gourmet equipped Kitchen. Then there is a great hot tub for 6 that you will want to spend time in daily! One of the best things of all is to sit in the evenings or early mornings on the outside patio under the live oaks and enjoy the sound views and nature with a cocktail or cup of coffee. Take advantage of the community rec center for a workout or take a bike ride or use our Kayaks to enjoy the sound. The list goes on and on so come see for yourself! Our home is located just about 200 feet from the Currituck Sound, all the sound front is community property that we have access to with about a half mile of sound front natural trails. The oceanfront is just a 7 min walk from our home or you can ride a bike or take the trolley which runs by the house every 30 min daily in season. The Trolley will pick you up at the house next door. All House Towels and Bed Linens are provided!! Beach Towels not provided. Out fireplace is not operational during the summer rental season. (3) One in Kitchen, One in first floor entertainment room, Small refrigerator in Great Room at wet bar. Fully Equipped Kitchen, Family size Crock Pot! There is a 50" Smart TV in the top level great room, TV's in each bedroom EXCEPT the bunk room and a 50" TV in the first floor theater room. There is a nice stereo in the top level media cabinet with surround sound. The downstairs media room has a Foosball table and games plus the theater with 9" overhead projection, drop down screen and surround sound. No music Library but Great Room Stereo system has MP3/I-Pod plug so you can play your own music on the system plus many CABLE MUSIC CHANNELS. NetFlix UNLIMITED MOVIE Access plus more than 350 titles in DVD library in Theater Room downstairs. This house is not wheelchair friendly, there is no elevator or lift. 6 Person Hot Tub on mid level deck, new and replaced Sept 2018. The house was perfect for us. There were 4 adults and 6 kids. The layout of the house was great, and we made great use of the bikes and kayaks! The owners were great to work with and were quick to respond to our questions. Thanks Beth for the kind words and we are so glad you enjoyed Blue Haven for your vacation and hope you will return! Thank you and we are so glad you enjoyed our home and the Corolla Light Resort community and hope you will return! This home was perfect for my family’s vacation; we had 7 adults and 4 children (ages 2-12). We used the properies bikes for the very short ride to the beach that also has multiple pools (the kids pool was a huge hit! There is so much to do and the property is well maintained and well equipped with everything you need for an awesome vacation along with being close to everything! We enjoyed rocking in the chairs on the deck and seeing the sound, laying on the hammock, rode bikes in the cul-de-sac, and even played in the small side yard while grilling. Movie night on the big screen was a hit! Clell, the owner, was easily accessible and ensured we had a wonderful stay! Would definitely stay here again! Third time here...feels like home every time... love the house, the location -it is heaven on earth! Thanks for your kind words and for returning to our home for your third time! We are honored to have you as repeat guest and hope you will return. As always we will continue to improve Blue Haven so your experience will always have a surprise! Could not have asked for more! Over delivered in every way! The owners were super nice and the House stunning! Incredible with lots to do! We had a great week with our group of 12 and thee generations. We hit up the beach, pool, kayaks in the sound, bikes, tennis, shuffleboard, walks along the sound, movies in the downstairs theater, hot tub time, great meals cooked in the very nice and well equipped kitchen. Even drove down to the end of the road and onto the sand to find the ponies. Overall a great family place if you are looking for lots of activities that are all free! We aren't really the shopping, mini golf, eating out every night crowd so we loved the laid back atmosphere of Corolla and the house exceeded all our expectations. Thanks for a great week! Watch your favorite movie in Blue Haven's Theater Room on the 9' Drop Down Screen, select titles from the DVD library with over 330 titles or pick a movie from NetFlix UNLIMITED access from our BluRay player,or bring your favorite movie to play on the BluRay/DVD player. Walk along the sound or paddle out in our 2 Kayaks, take a ride on one of the 6 bikes provided. Short walk to the beach or take a drive on the beach in the 4 wheel drive area (about 2 miles from the house) where you can find WILD PONIES on the beach or in the dunes, or fish, surf, sun. Weekly rates vary depending on season, see rate schedule for details. There will be a $100 Cleaning Fee added to each weeks rental. Refundable Damage Deposit Required. There are no refunds for weather or storm evacuations. You must agree to the terms of our Rental Agreement.